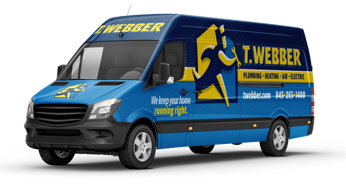 Generators - T.Webber Plumbing, Heating, Air & Electric. Protect your home or business from power outages by having a backup system in place. Install a generator! Throughout the Hudson Valley, we are no stranger to storms. When a storm strikes and potential black-outs occur, the best way to keep your electrical systems running is to install a backup generator. A generator will ensure your power remains on, your vital electronic systems remain online, and your food won’t spoil. Adding a backup generator will ensure your home and business remain productive, even during unexpected weather emergencies. Your water supply may be impacted. Throughout the Hudson Valley, many homeowners get their water from private wells. Without power, the well pump that draws water from the well will stop functioning, leaving your home without a water supply while your power remains down. That means – no flushing toilets, no bathing, no running water period. Your heating/cooling systems may be impacted. If your heating and cooling system are electricity-based, you will not have functioning equipment while the power remains out. In the event of prolonged power outages during the winter, this could potentially cause frozen pipes and other unwanted consequences. It can also negatively impact the comfort level in your home – with drastically cold or hot inside temperatures. Your communication channels will be cut off. Without power, you will be unable to charge your communication devices (cell phones, tablets) and your internet connection will cease to function. If your devices have not been previously charged, this will mean you will temporarily be cut-off from communicating with friends and family – or calling emergency numbers. Your food may spoil. When your home loses power for an extended period of time, the food in your refrigerator and freezer will become spoiled. This is not only wasteful but can also be costly to replace. T.Webber provides expert generator installations throughout the Hudson Valley, including Dutchess, Putnam, Westchester, Orange & Ulster county. Whether it’s the security of knowing you’ll have heat and water if the power goes out, or ensuring a commercial business remains fully operational, our backup Generator specialists will review your home and business needs and tailor an installation solution to fit your needs and budget. If you are interested in learning more about protecting your home and business from power outages, call T.Webber Services for a free generator consultation.